Strikers are game-changers. They create opportunities. They carry their teams to victory. Skill is top priority, but gear can be equally as important. Without the right shoes, stud pressure and poor traction can keep forwards from putting the ball in the back of the net. Weight – Lighter shoes create a more natural feel, which can greatly enhance performance and ball control. Field – Make sure that you choose a shoe that’s designed for the field you’ll be playing on. Material – Synthetic, or leather? The material choice will impact comfort, durability and the feel of the ball when you play. Speed and agility are the two most important things when going for a goal, so it’s important to find a shoe that enhances and supports both of these factors when you’re out on the field. Some of the best strikers in the world wear boots that feature grip textures on the upper for supreme ball control and the right stud configuration to maximize traction on the field. It’s all about speed, control and grip when comparing shoes. Cleats with thicker, bulkier materials will only weigh you down and keep you from scoring that game-winning goal. There are plenty of cleats on the market that are designed for a striker’s unique needs, but which one is right for you? We’ve rounded up the five best shoes for forwards based on performance, quality, price, and user satisfaction. Made by the most well-known brands in the world, these five cleats give strikers the traction, durability and light weight they need to score. 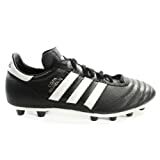 Adidas Copa Mundial – Built with lightweight kangaroo leather, the Copa Mundial possesses all of the qualities that strikers look for in a boot. The EVA insole and dual-density, direct-injected outsole offer unmatched comfort, while the stud configuration allows for maximum traction and comfort when playing on firm ground. The soft leather upper allows for maximum control and excellent ball feel, while the insole provides the support and shock-absorption you need to keep going. Offering a firm grip, the Copa Mundial allows for explosive acceleration, so you can make quick breaks down the field. The Copa Mundial tops our list of the best striker cleats because it provides you with the speed, comfort and control you need to score more goals. Adidas Messi 15.3 – Named after Lionel Messi, the Messi 15.3 is another striker-friendly cleat from Adidas. Although the upper is made from synthetic material, the textured surface allows for precision when kicking and superior ball control. The stud configuration allows for the flexible traction you need to get down the field and make the game-winning play. The bold orange, green and black design will be the only thing your opponents see as you leave them in the dust. For maximum speed, flexibility and responsiveness, the Messi 15.3 is the clear choice. Just be sure to buy these boots a half size bigger, as they have a tendency to run a little on the small side. Adidas Predito Instinct – With an eye-catching design, the Predito Instinct from Adidas offers control, support, comfort and durability at a price that players of all levels can afford. The all-in-one outsole surface allows these boots to be worn on any surface, while the cushioning studs offer support and comfort without sacrificing foot development. The synthetic upper is abrasion-resistant for added durability and features a leather finish in the forefoot for improved kick velocity. The triple stripe design on the interior of the shoe allows for maximum ball control and precision passing, so you never miss a beat. The Predito Instinct is a junior boot that any striker would be proud to wear, and its performance is top-notch. Nike Tiempo Genio – Built with full-grain leather, the Tiempo Genio is the shoe of choice for many professional and competitive players. The leather upper is durable and offers superior ball feel, while the midsole features a high-density EVA sockliner that minimizes stud pressure. Offering unbeatable comfort, you’ll forget you have these cleats on even after a full game. The TPU plate on the outsole features both bladed and conical studs, so you get superb traction and stability without experiencing any blisters or stud pain. Built with genuine full-grain leather, these boots do require a little breaking in, but they’re light and incredibly durable – two important things for strikers. Adidas Absolado Instinct – The Absolado Instinct boasts a similar design to the Predito Instinct, but offers a few extra bonuses. For starters, the synthetic leather features lightweight tetra polyurethane, so you can maintain control of the ball at all times. The abrasion-resistant upper also features a leather finish in the forefoot for superior ball feel. A 3D press pad is built into the side of the shoe, for precision passing even when playing in tight situations. The heel lining is made of nubuck for incredible comfort, while the lightweight EVA inlay offers shock absorption and cushioning. Anti-slip EVA inserts are also featured in the back of the shoe to keep your foot locked down throughout the entire game. Speed enhancement: Look for a boot that will allow for explosive acceleration, so you can make quick breaks to the net. Cleats that maximize traction work best, but it’s also important to look for shoes that are built with lightweight materials. Leather is great, but be picky about what type of leather you choose. Kangaroo is lighter than cow leather, and synthetic materials are the lightest of all. Comfort: Comfort is equally as important as speed. You can’t score goals if your shoes are uncomfortable or painful to wear. Cushioned studs and EVA liners minimize stud pressure, so you can play an entire game without virtually any discomfort. Fit: A good-fitting cleat will give you the support and comfort you need to perform your best as a striker. Look for cleats that fit snug, so your feet don’t move around while you play. If choosing leather cleats, remember that they will stretch out after a few uses, so it’s normal for them to be extra-tight at first. Cost: Naturally, your budget is another consideration. High quality shoes cost more, but you can still get an excellent pair of cleats at an affordable price. As always, buy the best quality cleats you can afford. And if you’re just getting started, there’s no need to invest in the absolute best shoes until you know that you’re committed to the sport. Finding the right soccer cleat isn’t always easy, especially for strikers. But these five models offer all of the qualities that forwards need to score more goals and secure more wins.